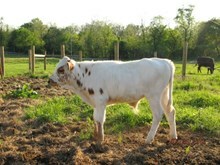 Lady is our oldest cow; purchased from G & G Longhorns. Her pedigree goes back to BL Night Chex, Don Juan of Christine, and Whelming King. She has not disappointed us at all. 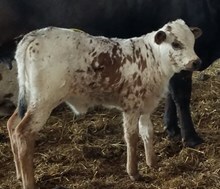 She is an excellent producer, mother, and milker. Her calves are correct in every way. She has produced Respectable Lady, Sittin Lady, and Sittin Lady Ginger, to name a few.